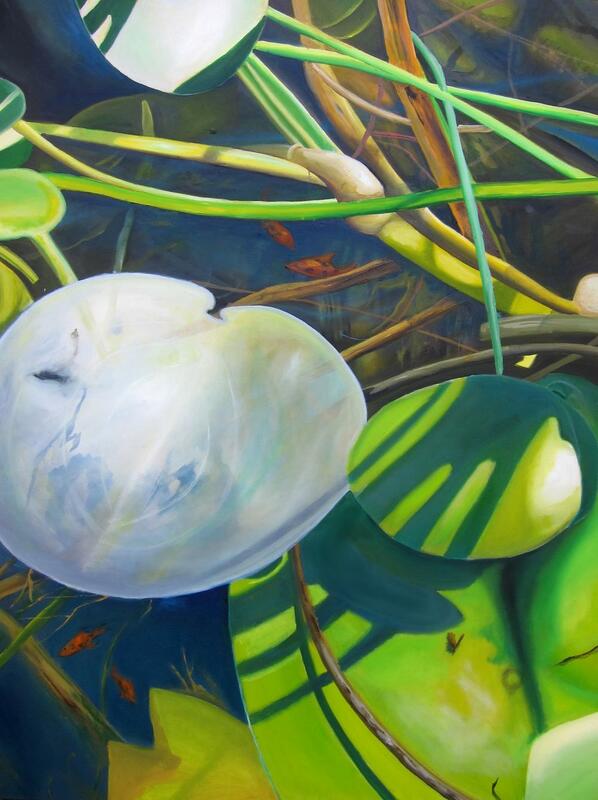 Pond – a New Botanical Painting. Pond is a new botanical painting. It is an intimate macro representation of a pond created from a series of photos taken at the Coffs Harbour Botanical Gardens. Many of my botanical paintings are inspired by photos taken and drawings done at these gardens. The gardens are filled with interesting scenes and ‘visual moments’ that are often complimented by my use of backlighting or other unusual lighting effects. The most difficult thing about Pond was achieving a balanced interplay between the curving lines of the reeds and other stalks and the simple round shapes of the lily pads. I achieved this balance by concentrating most of the reeds in the upper half and leaving the shapes of the lily pads to the bottom half. Pond also needed subtle toning. A series of glazes helped to created the illusion that some of the reeds were in fact situated underwater. The placement of these reeds is highlighted by the inclusion of the gold fish which draw attention to them and the other subtle details under the water. The painting is built up in thin layers of paint which gives the painting an inner glow when struck by a light. The layering has also added a lush richness and brightness to the main motifs giving the subject its moist quality, and the green is also rich, alluding to the healthiness of these plants which live in a small intimate pond and are constantly fed by the constant presence of plenty of water. Sunday, September 27th will see the beginning of another group exhibition at the botanical gardens here in Coffs Harbour. This exhibition will continue near the entrance of the gardens for about a week. 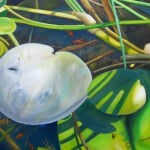 Pond will be one of the paintings I will be exhibiting in this show. This entry was posted in Uncategorized on September 13, 2015 by Lenny. Ambrosia: Food of the gods. Ambrosia is described in Greek and Roman mythology as the food of the gods. I love the idea that people can contribute to the happiness of ‘the gods’. I believe in the one God and although there is nothing we can give him that sustains or edifies Him I still believe He enjoys our meagre attempts to make Him happy. 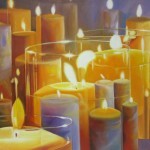 In this painting the food of the gods is represented as a collection of lights (candles) that may or may not be lit as a devotion to Him in some way. 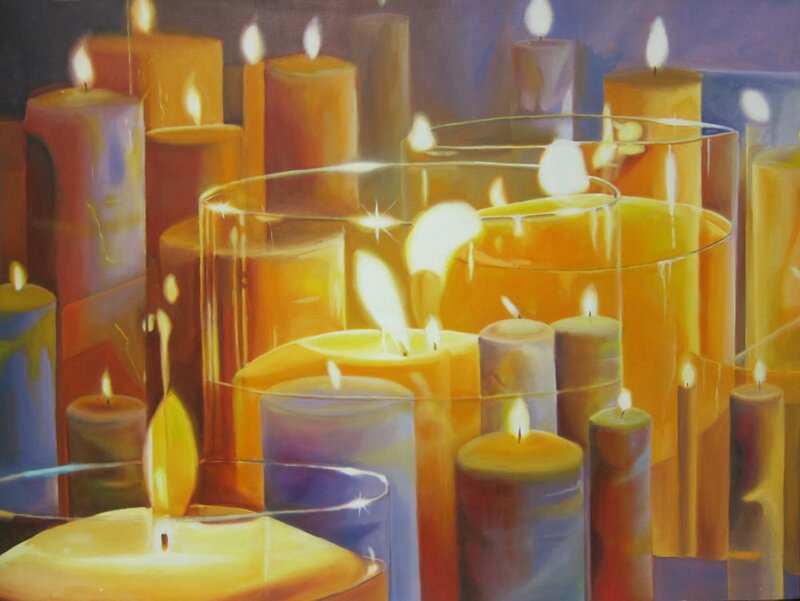 God is light and these lights may only be flickering symbols of the light that is God, but they (lighted candles) are often a symbol of appreciation for all that God has done for us and those we love. The use of a golden yellow in the painting alludes to the golden city of light that Revelations talks about as Heaven. The lights of the candles may not fill Heaven with any practical light, but the joy it brings God and the angels is a light in itself. Any kind of communication with Heaven is a joy to God and the angels. God created us because of his unsurpassable need to love and be loved. His light shines on us daily and it should be a pleasure to return some of this back to Him. I love painting light. I used complementary colours (yellow, purple) as a symbol of all the colours of the spectrum – it takes all the colours of the spectrum to create white which is light. I tried to make the wax of the candles look soft and almost edible and I hope that the title suggests a kind of perfume which reaches God and brings joy to Him. This entry was posted in Uncategorized on September 8, 2015 by Lenny.